Kamal A. Farooqi (KAF) thanked MSH for providing his house for the meeting and arranging a very delicious after dinner for all the attendees. SAEEA visited five persons; via: Iftikhar Ahmed, Iqtidar Ahmed, Mahmood Hussain; they are sick and sorry to announce that SAEEA also visited Majid Qureshi who died after two days. Also, visited Younus Shaikh whose grandson passed away one week back. SAEEA visited Ikhtiarun Nabi and Mumtaz Ahmad. They are American national and were on visit to Pakistan. Ikhtiarun Nabi is back to USA; however, Mumtaz Ahmad is still here and will return back on August 01, 2015. SAEEA (Matin) visited Alimullah who is sick and under treatment. The current bad weather hit southern part of Pakistan and killed thousands people. SAEEA did its part and sent messages and called several people to know their welfare. Finally, IAK did a fantastic job and published the news with precautions saving from the bad weather. Shabbar Hassan Abidi is hospitalized in the Tabbah Hospital, Karachi, for his heart surgery. The surgery is successfully completed and now SAEEA plan to visit him soon. 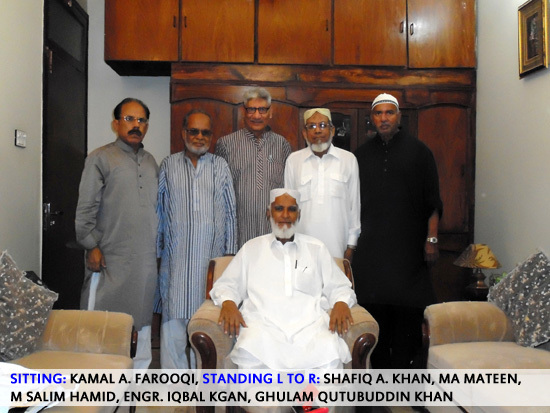 SAEEA (Matin and Shafiq) visited ex-Aramcon, Syed Mahmood Ali, an American Family, recently moved to Karachi. The Family is very social and anxiously waiting to attend SAEEA 13th reunion. Mahmood became SAEEA regular Member. 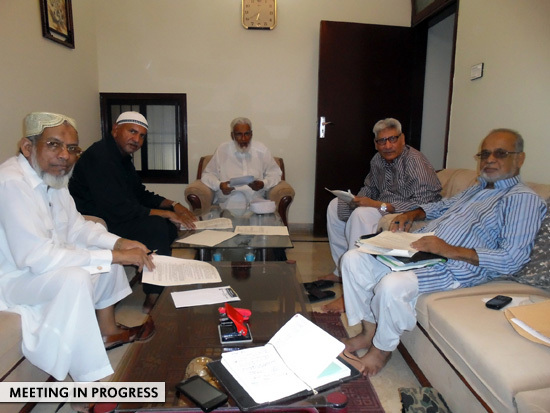 KAF with the agreement of other Members, decided to have SAEEA 13th Reunion after Eid tentatively August 09, 2015. At the same time SAEEA will also celebrate its 5th anniversary. KAF requested MAM to look for a good place for the next function. There are lots of gifts for distribution; through lucky draw, among SAEEA Paid Members only. Since Mrs. Khan has joined SAEEA as a Ladies Representative, KAF feels a separate meeting with the two Ladies Representatives will be held after Eid. SAEEA next elections are due after August, 2015. KAF suggested having a Son/Daughter of a SAEEA Member, to be added with the SAEEA Team to enable him/her to learn SAEEA activities. By having someone from the new generation, SAEEA may exist for a longer period of time. It was decided to create a Compact Disk (CD) describing SAEEA functions/activities and distributing the same among SAEEA members. We may also do samething to attract other ex-employees of Saudi Aramco, who are still not our members. SAK, GQK and MAM have been working on this project and will coordinate with KAF once the material is ready for the CD. IAK has been facing problems in running SAEEA website. SAEEA website www.saeea.com.pk is hacked. IAK is struggling hard to start the website again. If he fails, then there is no other option but to establish a new website from scratch. GQK would like to spend some time in European Countries. KAF prayed for fast recovery of (1) MSH’s Mother (2) Anwar Mirza (3) Iftikhar Ahmed (4) Mahmood Hussain (5) Jaleel Khan (6) Farough Ahmed (7) Alimullah (8) Iqtidar Ahmed (9) Mumtaz Ahmed and others. He also made Doa Mughfirah for Majid Qureshi and others, who are not with us.